When you see an extraordinary five-petaled Tiare Apatahi blossom rising out of it's bed of dagger shaped leaves, you immediately want to pick it. Or, if you're like me, you get the desperate urge to dig up the whole bush to bring home and plant in your yard. But you can't do either of these things. The Tiare Apetahi was nearly plucked to extinction and now it's heavily protected. Also, no matter how hard botanists and gardening freaks have tried, the plant simply won't grow anywhere except the tropical high slopes of Raiatea's Temehani Plateau. Today the unusual looking flower is the island's emblem. 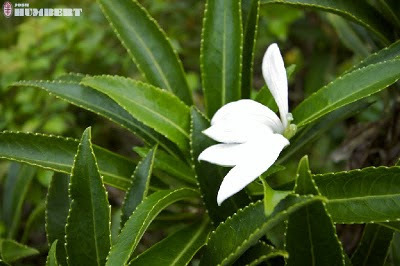 Of the 182 plant species indigenous to French Polynesia, an amazing 26 of these only grow on the Temehani Plateau. Scientists have not yet understood what makes this area so biologically special or why certain plants like the Tiare Apetahi simply won't grow anywhere else. The plateau is regularly exposed to strong winds and heavy rains so it's a harsh environment for the region and not nearly as lush as the valleys. It's guessed there's something special about the soil or that there's some sort of rare fungus that the plants thrive on and can't live without, but nothing concrete has been discovered. The only explanation of how the Tiare Apatahi came to grow on Raiatea's highest slope comes from Polynesian legend. Long ago, the beautiful Apetahi fled to the Temehani Plateau after a terrible argument with her husband after she discovered he had cheated on her. She was so sad she wanted to die. In her sorrow she dug a hole, cut off her hand and buried it. Soon after, she died from blood loss. Many years later some locals were out looking for bamboo and heard a strange sound. They followed the noise and came across a small plant that grew right where Apetahi had buried her hand. Immediately they saw the similarities between the delicate five-finger petals of the flower and the lovely hand of Apetahi. Tiare means flower in Tahitian so the flower was named Tiare Apetahi after the woman and her tragic story. I popped by via Expat Women site. Such an interesting post! Love the insights about rare island flora (of which I'm a huge fan, esp. of the silversword in Maui's Haleakala volcano). Keep up the great writing! -- S.
Gorgeous story behind it. (Okay, maiming and mutilation featured, but still, gorgeous). It looks awfully fragile to withstand the harsh weather you mentioned. I reckon it's stubborn and bloody-minded. That's why. Reckon it'll take scientists a few years to confirm it, but I've seen behaviour like this in elderly two-legged mammals I know. ("Why are you sitting on the beach in November, dude? It's freezing! ", "Because I CAN. Anyway, it's fresh, not freezing. Now leave me alone, dammit! ").